That evening Jesus' disciples went down to the shore to wait for him. But as darkness fell and Jesus still hadn't come back, they got into the boat and headed across the lake toward Capernaum. Soon a gale swept down upon them, and the sea grew very rough. They had rowed three or four miles when suddenly they saw Jesus walking on the water toward the boat. They were terrified, but he called out to them, "Don't be afraid. I am here!" Jesus' words to his terrified disciples were powerful. 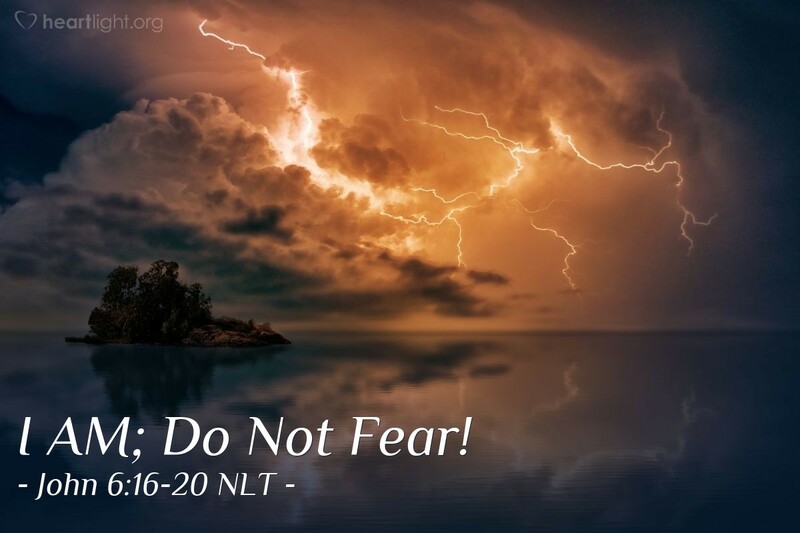 Literally, he said, "I AM; do not fear!" Built on his "I AM" statements throughout the Gospel of John, this one shouldn't be underestimated. Jesus' words in today's verses built upon the twin concepts of the God of Israel who revealed himself as the great "I AM" in Exodus 3:13-15 and the God who rescues from the ocean deep in the Psalms (e.g., Psalm 107:28-32). Effectively, Jesus was saying, "I am God with you; you don't need to be afraid! I can still the storm. I can preserve and protect." Jesus comes to us in the middle of our storms and says the same to us. Storms are inevitable. But rather than cowering in the storms of our lives, we need to remember that Jesus comes and meets us in the middle of the storms, so we don't have to be alone! Give me faith, O God, to believe that in even the worst of my life's storms, I can trust that you are there and that you will ransom me home. Thank you for the assurance that you will never leave me or forsake me. In Jesus' name. Amen.